Before you go to our highly-researched top picks for the best dog life jacket to have your four-legged companion accompanying you in open water activities, make sure to read our informative and easy to follow guidelines first, and the explanation why your dog needs such attribute anyway even if your companion is an excellent swimmer. Why does a dog need a life jacket if the pet is a naturally good swimmer? First off, not all breeds are naturally gifted swimmers, for instance, the Bulldogs. If it is not afraid to get into open waters, it may cause even bigger worries due to the risk of drowning. Either way, if your dog is afraid to or unable to swim, we highly recommend reading our article on How to teach your dog to swim before experimenting on your own. In such cases, the necessity for a life vest is kind of self-explanatory. What if your dog is already a solid athlete in the water? Well, if you’re an avid boater and like to go with your friends and family on boat trips, you may have considered taking along your pet as well. Now, you definitely have forethought about safety and brought some life jackets for homo sapiens in your crew (or at least you should have). We have no doubt that at least some of them are excellent swimmers but that’s no excuse in such scenarios. Now, your great four-legged swimmer must have one as well. Firstly, you can never 100% predict how your dog will behave, and if it ends up in open waters far away from shore for one reason or another, a doggy life jacket can be a real savior as we cannot estimate exact level of endurance of our pet. This is especially crucial to overweight dogs and smaller breeds who may not have what it takes to make it back alive and well. Okay, so, if my dog is a decent swimmer, I only must get a life jacket if we’re going offshore? The answer is no, not necessarily. The reason for that you must never underestimate the combined unpredictability of your dog and mother nature. 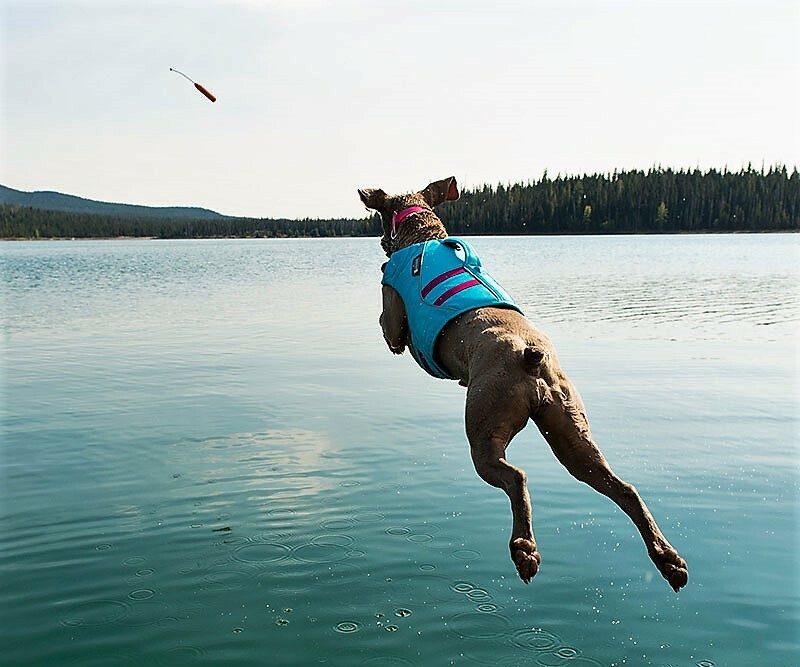 Life jackets for dogs are a great idea for even greater swimmers when you’re at a like for various sporting activities, such as windsurfing, and you cannot keep an eye on your pal all the time. What to consider and look for in a dog life jacket? Size and comfort. It must fit your individual fella very well. Please do make sure your dog can sit down comfortably and relieve itself while wearing it. We suggest you measure the torso and girth of the dog before the purchase. Buoyancy. A proper amount of buoyancy to keep your four-legged friend afloat in the water is another must (kind of the main point of the life vest, isn’t it?). There are dog life vests that have flotation under the belly, whereas other have their flotation in the neck area to help keep your dog’s head above water. Which one is better depends on the individual fella. Handles. This is especially crucial when you find yourself in a situation where you must pull the dog out of the water to prevent something unwanted. Therefore, strong handles on the dog life jacket is a great feature to have. Reflective material. This will help your dog stay visible not just for your own peace but also may prevent a collision with other paddlers or jet skiers. If no reflective material, then brighter colors in general would be the next alternative. Quality material. Simply put, a material that will serve you for a long time, and you’ll know for sure it won’t dismantle after just a couple times of usage. HM tip: The first two are an absolute must, although we strongly recommend you take into the account the third, fourth, and fifth pinpoint as well as it’ll be much safer in various conditions. Speaking of safety, we’d also suggest a life vest that has interior straps and buckles to avoid getting hung up on foreign objects. Now, we’ve outlined the main criteria and qualities to look for in a dog life vest above. 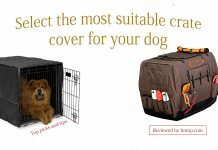 Without any hypocrisy, this jacket meets all five making it a true 5-star product – it’s made of extremely sturdy nylon fabric (abrasion-resistant), the handles are comfortable and very durable, and therefore suitable for heavy breeds. You have to choose an appropriate size yourself, though, as it’s not that much adjustable, except for the adjustable neck closure, however, don’t worry – K-9 offer these vests in 6 different sizes that should match your individual fella. Yet, be aware that even the smallest size might be somewhat too large for an extremely small and light dog breed (do the measurements and compare to the chart). Strategically well placed closed cell foam panels enable your dog to maintain their natural swimming position, therefore, this product’s quality isn’t just fantastic for boat trips and other activities in open waters, but also for dogs training to swim as it allows great comfort and movement while also having a great buoyancy. This life jacket for dogs also includes the reflective feature for better visibility. HM tip: Go for our pick No. 1 if you really love outdoor activities and like to take your four-legged friend along very often – if you’re by a seaside, public lake, or going on a boat trip. Definitely the best in terms of overall quality and diversity in terms of suitable water activities. This life jacket provides good buoyancy and, unlike most other life vests in the market, has practically no exterior straps (none on the back or the sides, the straps run underneath) which we favor over vests who do possess those as that increases the risk of getting hung up on foreign objects. The grab handle is solid though a small step down in terms of quality and durability compared to our pick No. 1. Features reflective material, too. HE&HA PET Dog Life Vest comes in 5 different sizes, therefore, suitable for different-sized dog breeds. Overall, a way less-expensive alternative for Ruffwear K-9, and still can be used in various open water activities because of the quality features it possesses, and we would describe it as our runner-up in the category of value-for-price (look down for our 3rd pick for our winner within the category). HM tip: As stated above, consider this the best alternative for Ruffwear K-9 for a cheaper price. Although the overall quality of materials might be somewhat lower, it still is durable enough as it’s intended for similar sporty activities and quite extreme situations as our pick No. 1. We have to admit, there’s a good reason behind why this is the number one bestseller on Amazon – it provides comfortable buoyancy and movement, and safety by having two (!) solid handles on the back of it. The vest also features reflective material for better visibility. And most of all – it’s affordable for every pocket. We have to also point out the extra flotation in the front, meaning, this particular jacket has an extra pad of flotation by the dog’s head to ensure that your dog is always able to keep its head out of the water. So, another great safety feature if 1) you’re going on a boat trip in open waters, 2) your dog’s just learning to swim. Overall, the quality and materials that have gone into manufacturing this product are quite decent making it a really good and durable dog life vest, however, it may get ripped off relatively easier than our quality pick No. 1 (and No. 4 for that matter). HM tip: Consider this the best dog life jacket in terms of value for money you spend. Sure, our job isn’t to point out the cheapest one, but to recommend a quality product as it’s intended for activities that require extra safety and attention, however, due to the fact that Outward Hound Ripstop Dog Life Jacket meets basically every quality criteria (except for the exterior straps which may not even be the smallest issue in your case), we can easily put this in the top this and recommend as the best value-for-price life jacket. This life vest for dogs is made from durable materials while also being light in weight, and shouldn’t lead your dog to overheat on hot summer outside the water. This jacket is an excellent choice for smaller breeds that fit better in proportionally shorter vests – although it comes in different sizes and is suitable for larger breeds as well, and it does allow relatively free movement. It also has the reflective feature for better visibility in open waters, and the straps are made from a durable neoprene. The one small drawback we found was the grab handle. 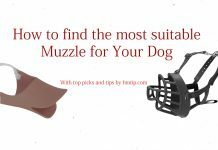 Although the manufacturer claims and some online reviews find it great, we wouldn’t call it the best – it doesn’t feel anywhere near sufficient and comfortable compared to Ruffwear K9 handle that allows to grab it easily in any extreme situation. EzyDog life jacket is built in such manner that it keeps the dog very straight while in water. Overall, it is a very solid life vest made from one of the best materials. HM tip: Consider this a truly great choice for small to medium-sized breeds. By no means it’s unsuitable for larger breeds as well – unless you’re a fan of potentially more dangerous and extreme activities in open waters where you have to react quickly in a certain situation. Overall, it’s still one of the very best life jackets for dogs available in the market (though not our winner in the value-based pricing category). In general, it’s just a very decent life vest for dogs but the reason it really stood out for us is its great reflective material which provides an excellent visibility in the water. In addition, if you decide to purchase this item, they provide you with a 4-1/2 foot long novelty ski rope leash which is a nice bonus. It doesn’t provide any fancy head support and, although the material quality definitely isn’t bad, it cannot boast with the greatest durability in this top. Also, the grab handle isn’t top-notch quality, although, again, decent and definitely easy to grab. Overall, it is decent in all main criteria and excels in the visibility regard. We’d also like to point out the straps which, although you could say exterior, are well placed for safety purposes. HM tip: We would suggest as a good and less expensive alternative for small to medium-sized breeds as it might not be durable enough for an active large breed. If you intend to take your eyes off from your little fella for a while to get a suntan or something, this life vest provides excellent visibility to reconnect with your companion immediately. This life jacket comes at a higher price BUT it offers a lifetime warranty against manufacturer defects when purchased new from an authorized dealer. Furthermore, it’s more than simply a flotation device – it also supposed to work as a three season dog rain coat (you just remove the inflatable liner, and also add a padded layer for warmth if needed). Kurgo Surf N Turf Dog Life Jacket has two grab handles, though we wouldn’t call them of superior quality in terms of comfort (how easy to grab un pull). Also, it’s not the most adjustable. Another drawback is that the vest doesn’t provide an excellent flotation support underneath (especially for smaller breeds), and that’s an important aspect when looking for the best dog life jacket, which is kind of expected for this price. We have to point out, however, that this vest provides great freedom of movement which is also quite important. Overall, this should be regarded as a multifunctional dog vest and might be just sufficient in the water for some breeds that are better swimmers. HM tip: Consider this multifunctional (life) vest if you have an athletic companion (medium to large breed) who likes to move around and is at least a decent swimmer already. Also, consider if you could actually use the multifunctionality of it as it comes at a certain price. Here we’ve given 6 solid choices for you. We’ve ordered them based on overall quality and our individual preferences, however, which one is best (most suitable) for your individual dog, you can easily decide on your own by following our simple guidelines and tips for each life jacket. For example, we put the stress on those internal/external straps, however, it might not even be an issue for you if you don’t plan on taking your fella to public places but instead teach to swim in your private water body (a lake, pool, etc.). Maybe you could use the multifunctionality of Kurgo Surf N Turf Dog Life Jacket, but maybe that’s not on your priority list at all. At the end of the day, we can guide you and recommend but the decision is yours. If you’re still unsure, leave us a mail or comment, and we’ll do our best to assist you in your individual case.